The root of all that was to communicate that my early experiences in manual labor were framed in calculated precision and a “measure twice, cut once” mentality. Fast forward a few years and I’m the founder and president of a brewery in east Austin that is on the precipice of releasing our very first bottle conditioned mixed culture Saison. Mind you that this is our first bottle conditioned release at Hops & Grain and I personally haven’t bottle conditioned anything since my early days of home-brewing at the turn of the millennia. Given the background that I just outlined for you though, one would assume that we ran multiple trials in our state of the art lab, testing them on our trained sensory panel and went to the drawing board multiple times until we got the carbonation levels just right. Turns out, that’s not what we did at all. Sometimes you just have to trust your instincts, right? Maybe sometimes you just have to be quasi-reckless is a better way of saying that. Back at the tail end of 2016 we received two beautiful American oak foeders from our friends at Foeder Crafters of America. These two oak tanks were earmarked for a new series of beers that I’d been cooking up in my head for some time. Long and short of it, we were planning on launching a line of mixed culture Saison’s, all utilizing the same base recipe but influenced in many different ways by the oak vessels they rested in as well as the mix of wild yeast and bacteria that would make up their internal culture. As we stand here, there is currently 100-ish bbls of Saison in some stage of aging in our Saison room and much of it is ready to blend and bottle. Bottle you say? Yes indeed, also a first for us at Hops & Grain. And bottle condition no less! Because why the hell not, mediocrity is certainly (and figuratively) death. Someone famous must have said that. Rather than testing a bunch of small batches with varying amounts of priming sugar and varying yeast cell counts, we decided to read a bit and throw caution to the wind. Just do it, amiright? Turns out there are wildly varying opinions on how best to handle the process of bottle conditioning and a dizzying array of variables to take into account. But the thought kept coming back to me that this is something that tons of breweries are doing, it can’t be total rocket science, right? So we just did it. And in an interested stroke of luck, it worked out beautifully. Mind you we did take a somewhat calculated approach in that we only bottled 7 bbls worth of Saison or some 80 odd cases of 750 mL bottles. The priming sugar was dosed and we relied on the wild yeast resident in the beer to handle the secondary fermentation that would, hopefully, carbonate all 960 of the bottles that we filled. Oh yeah, we also filled them on a brand new bottle filler that we had never used before. When it rains, it pours, as they say. That was 3 weeks ago and I’m excited to announce that everything actually worked out. And now we have 80 cases of bottle conditioned, mixed culture Saison that is tasting beautifully after almost 10 months of residence in an American oak foeder with a mix of 3 strains of brettanomyces and our house Saison yeast strain. 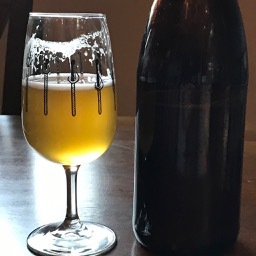 The final product is full of complex flavors ranging from wood derived toasted coconut and vanilla notes as well as yeast derived aromas and flavors of earthy, subtle funk and tropical notes from the secondary aging with wild yeast. I theorize that these are the result of a long term metabolic process whereby brettanomyces ferments not only the complex sugars still remaining in the beer but also finds an overnight guest with the wood derived sugars, cellobiose. A touch of funk, some tropical notes, oakey-ness and a dry but smooth finish. I’ve been testing bottles over the past 3 weeks to understand a couple things. So far I’m pretty confident in our findings for most of these 4 data points. Gravity reduction has basically finished, carbonation seems to be good and flavors are developing nicely. As far as secondary fermentation endpoint? Give me another week and I’ll that know for sure. Your first chance to sample this new beer of ours will happen at the Texas Craft Brewers Festival. Your second chance will happen if you attend the Great American Beer Festival. The third chance, and the one I may be most excited about, is happening at a rad little beer dinner we’re planning with our good friends at Barley Swine, slated for October 22nd. Hindsight being somewhere near 20/20 I would probably not do this again without any previous tests. I’ve become somewhat beholden to our quality control lab to tell me when/what/why with our beers but at times it’s refreshing to get back to “intuition”, as it were. This time it worked, and I can’t wait to share this with you all!